Feedback from our readers continues to support us reporting the most up to date observations on real estate trends in the Tallahassee housing market. When we conducted a recent real estate survey, 100% of the respondents requested that we provide accurate information about the Tallahassee real estate market. We will continue to do that. In fact, we have a great real estate graph to review today, and it might just be showing the start of a something that we have been long awaiting as we monitored the real estate trends in Tallahassee. 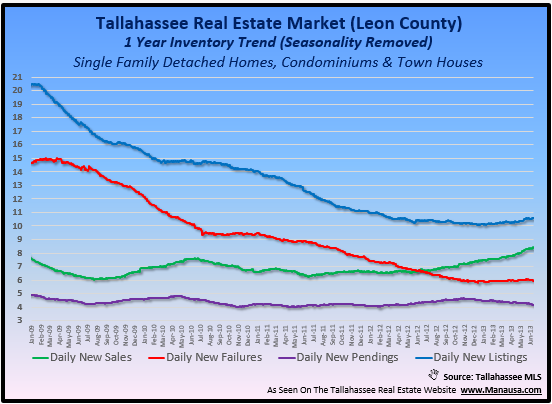 Long time readers of the Tallahassee Real Estate Blog know that I believe the Pending Home Sales Report is one of the most vital real estate trends report that we can monitor, as it is the most current information available about present market actions. By looking at new contracts that are recorded each day, we literally have our fingers on the pulse of the market. By creating a real estate trends graph of this information, we can compare present market behavior with past market behavior in order to identify the current direction of the real estate market. When we look at the real estate graph above, we can see that the one-year trend of pending home sales has reached a two year high. Simply put, this means that the number of daily new contracts written over the past year is better than we have seen since the Summer of 2010. And of all real estate trends to be on the rise, this is the best for the market. New contact growth could indicate that real estate demand is on the rise. It is far too early to tell if this will continue. The graph shows that the last two times demand increased, it was thwarted and new contracts returned to declining trends. If this time we can push higher, it will help move us towards a market correction. Do not misunderstand this graph, home values are not reflected here, nor is real estate supply. We know that we have an abundance of supply and that home values will continue to decline, but an increase in demand is great news nevertheless, as it will "get us there quicker." I remain cautiously optimistic that this most important of real estate trends will continue to rise, saving 2012 from being the worst year on record in Tallahassee.